A number of people were hospitalised after the collision. Scene of the crash on the Naas Road in Dublin this evening. A NUMBER OF people were hospitalised after a two-car collision in rush hour Dublin that led to disruptions on the Luas red line. The crash happened at about 5pm at the junction of the Naas Road and Kylemore Road with one of the cars overturning after it was hit. At least two units of Dublin Fire Brigade and an ambulance were tasked to the crash with paramedics treating injured people at the scene. The accident caused serious traffic problems on the commuter route in south-west Dublin before it was cleared. The Luas red line was also disrupted as emergency services worked at the scene of the crash but the service is now back operating as normal. The condition of those hospitalised is unknown at present but their injuries are not believed to be life-threatening. Delays on the Red Line heading into the City Centre due 2 a non Luas related incident. Apologies for any inconvenience caused. Email “Two-car crash on Luas red line causes rush hour delays in Dublin”. 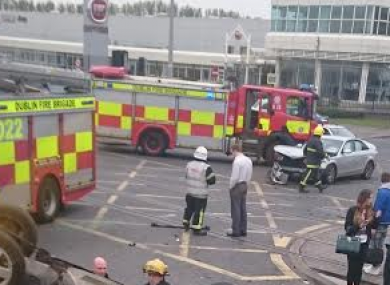 Feedback on “Two-car crash on Luas red line causes rush hour delays in Dublin”.